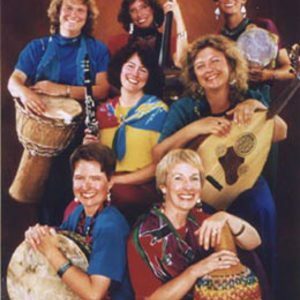 Libana is a women's world music ensemble that illuminates the creativity, vision, and spirit of the world's women through the performance of traditional and contemporary music and dance. By raising awareness and appreciation for diverse cultural expressions and the universal themes that unite us all, Libana inspires intercultural understanding, healing, and peacebuilding. Libana takes its name from a 10th century Moorish woman, who was a poet, philosopher, and musician, symbolically representing women's creativity and vision throughout time. The group was founded by its Artistic Director, Susan Robbins in 1979, with the idea of exploring and performing music and dance which reflect women's often undocumented creative contributions to their cultures. For the past 31 years, they have taken audiences throughout North America and Europe on inspiring and celebratory musical journeys, weaving together the songs, dances and instrumental music of the world's cultures, especially as handed down through the artistic traditions of women.